What makes the media check their brains at the door when the story is about dead celebrities and psychos? I will see Jeff’s quote and raise him one: The only experience anyone needed to discern the guy was a mental case is a modicum of walking-around common sense. 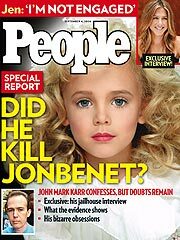 Pathetically ironic is the sad fact that the only reason JonBenet is a celebrity is because for years before she was brutally murdered, her mother dressed her up to look like a celebrity on a magazine cover. Dern, I had almost finished my screenplay.